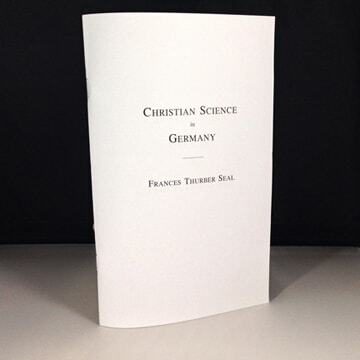 We have now published a newly typeset version of the inspiring book, "Christian Science in Germany", by Francis Thurber Seal, in paperback format. This book tells of her experience in bringing Christian Science to Germany in 1897. She had found Christian Science less than a year before, and didn't speak a word of German! Yet through her love and faithfulness to God, she was able to bring Christian Science to Germany, teaching classes to people from all over Europe.